At the end of a week like this it is important to stay in touch with our sense of humor. Volatility means up and down and up and down and up and down. Volatility is not a synonym for straight down, or loss of shirt. Today the Dow is up 300, after seven-straight down days and losing 1,740 points. Maybe volatility ahead, but not behind. Stocks do these things sometimes, especially after big gains. The stock market may be the single best example of reversion to mean: too low, goes up; too high, tumbles. 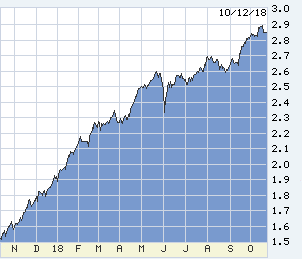 The stock market mean is tilted upward (has been for 150 years or so, presumably continuing), but the mean is invisible and changes slope from time to time without notice. Hence Warren Buffett’s inspired advice: just buy the S&P500 index and then don’t watch. Put your fingers in your ears, and chant “nah-nah-nah-nah.” To the tune of “Hey Jude” if you like. The equity pratfall did push down rates a little from last week’s run up, but no more than they might have slipped anyway. 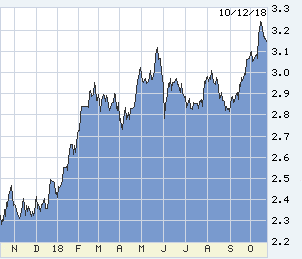 The 10-year T-note has fallen from a Monday top of 3.26% to 3.13% today, taking mortgages back from 5.25% to about 5.125%. The 2-year T-note has fallen only 0.08%, properly indicating no change at the Fed. Speaking of which… this week everybody spoke about the Fed. Mr. Trump in a two-day riff: the Fed is “crazy,” then “loco,” and “out of control.” Takes one to know one. Jim Cramer, for example, whose show is called “Mad Money” for good reason, today offered this: “The economy’s already peaked… I agree with President Trump that the Fed needs to tighten less aggressively, even as he probably shouldn’t have said those nasty things,” and the Fed should hike one more time and then ease. “I don’t think it’s gone crazy at all. I think it’s gone lazy… and all I can say is they know nothing!" Markets are slowly adapting to a new way of living: ignore what the president says. It will just upset us, and if some statement does have a rare, actual consequence it will be a surprise. So be cool until the surprise. This morning’s tweet: “Everyone wants Ivanka Trump to be the new United Nations Ambassador.” Everyone is thrilled by Pastor Brunson’s release, and we don’t mind the Saudis adopting Czar Vladimir’s hobby, creative assassination of opponents on foreign soil. Why bother to make sense of any of that? This stock decline will have no effect on Fed policy unless it’s big enough to produce a reverse-wealth effect. Stocks have done so well that that market money has clearly leaked elsewhere, into housing and general exuberance. So far, the decline makes the Fed’s job easier. William McChesney Martin, the record-holder for longevity in the Fed chair, gave us the line about the Fed’s duty to remove the punch bowl just as the party gets going. Economies have several punch bowls, and it is ideal to have them disappear progressively rather than all at once. Powell’s Fed is playing a sophisticated game, in part un-doing the approach of predecessors. First, he has come as close as a Fed chair can to ridiculing the econo-nonsense of a precisely located “neutral rate,” forcing other Fed people into hasty retreat (notably John Williams, NYFed). Closely related, Powell has advised us not to watch the Fed, but to watch the economy. Prior to Alan Greenspan the Fed said nothing. In Paul Volcker’s eight years, his one, clear policy statement came in his first year on the Saturday of Columbus Day weekend, still engraved on my soul: we will let the Fed funds rate float as high as necessary… and float it did. The Fed never even announced targets for interest rates, its traders often calling bond dealers to ask, “How tight are we?” If we gave an answer less tight than the Fed intended, the next day the Fed would kill us. Those calls turned tough traders into Jell-O. Political pressure forced Greenspan into making policy statements after Fed meetings. He complied with one short sentence. Greenspan could speak with eloquence and technical majesty without saying anything. For all of Bernanke’s heroism and genius, he turned the Fed into a chatty faculty club, and emphasized transparency and future guidance. Guidance came in handy after 2008 when the Fed needed to jawbone rates down. Today with great wisdom, Powell wants anti-guidance. You figure it out. If we give you the answer you will trade and make investments based on what we’re going to do, not the economics of trading and investment. The Fed needs markets to give signals to the Fed, not to engage in Fed tail-chasing. Increased uncertainty around the Fed reduces market risk. Uncertainty begets caution. Janet Yellen began the shift in attitude which Jesuit-trained Powell is reinforcing: suppress ego and stay in close touch with the limits of Fed understanding. For heaven’s sake, don’t trade on us because we don’t know where we’re going! We know our objective — the fastest possible economic growth with least risk of inflation — and we have lots of tools, but every situation is different, and a tool which had one effect last time has a new effect or none this time. Many at the Fed are prepared for a death march, open-ended .25% hikes every 90 days, and when the economy slows hope to stop in time, pause or cut. Some are with brilliant Kaplan in Dallas, three more hikes and pause. 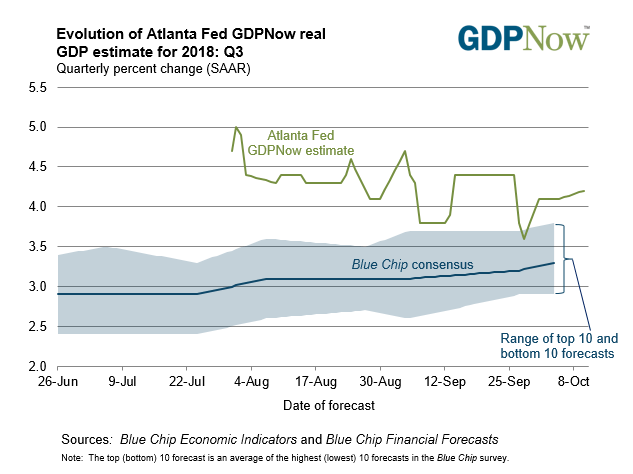 But above all else and unlike predecessors, this Fed is going to watch the economy change in real time and adapt, not offer pretense of foreknowledge.